Saturday, April 20, 2019 - Village Charcuterie Fest in downtown Stevensville, MI from 1PM - 5PM ET. Click here for more info & to purchase tickets. 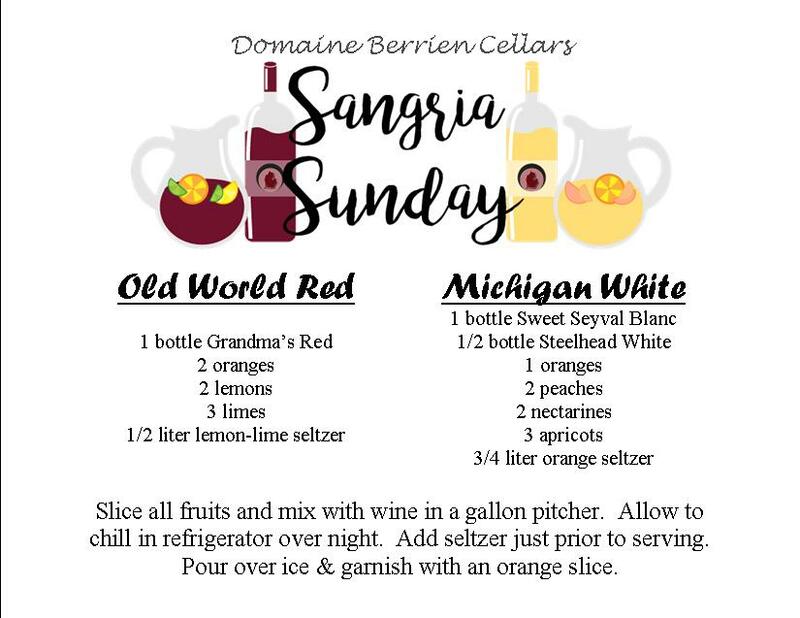 Sunday, May 12, 2019 - Mother's Day Celebration at Domaine Berrien Cellars, Berrien Springs, MI from 12PM - 5PM ET. Click here for more info. Saturday, June 15, 2019 - Lake Michigan Shore Wine Festival at Warren Dunes State Park, Sawyer, MI from 1PM - 9:30PM ET. Click here for more info & to purchase tickets. Saturday, July 27, 2019 - 15th Annual Art, Wine, & Music Festival at Domaine Berrien Cellars, Berrien Springs, MI from 11AM - 7PM ET. Click here for more info. Rave Reviews From Around the World! Our good friends from Baroda, MI were nice enough to send us three bottles of your wine for the holidays. When I saw the label it reminded me that we had a bottle left over from a previous gift in our cellar. I went to lay down the three that they sent and retrieved a bottle of your 2003 "Crown of Cab". I realized immediately why we had saved it; 57% Franc! I guess we thought it could use some time to mellow. We were correct. We opened the bottle and decanted for about an hour. We were very impressed by the wine's staying power. It has good fruit but I swear it could easily hang in there for another 7 or 8 years. We just wanted to let you know that you have some fans in California. We tend to seek out unusual wines here and loved your cuvee'. 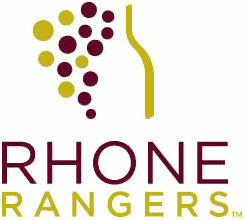 Domaine Berrien Cellars Wins Gold Medals! Wally Maurer is usually known for his outstanding red wines, is racking up the gold medals this spring on his newly released white wines. Domaine Berrien Cellars is proud to announce the receipt of 3 gold medals, 4 silver medals, and 2 bronze medals for their 9 wines entered in the 17th Annual Great Lakes and Beyond Wine Judging, held in Farmington Hills, MI on May 17, 2012. The 3 gold medal winning wines are Domaine Berrien Cellars 2010 Marsanne, the Domaine Berrien Cellars 2011 Marsanne, and the Domaine Berrien Cellars 2011 Dry Traminette. The 2010 Marsanne is the first Marsanne that Wally Maurer, Domaine Berrien Cellars' winemaker and owner, has aged in oak barrels. During his travels in the Rhone River region of France where the Marsanne grape is extensively grown, Wally saw most winemakers using oak in their fermentation and aging of white wines, and he decided to utilize this technique for the 2010 vintage, resulting in a buttery, full body and flavors of honey and toasted butterscotch. The 2011 Marsanne, in contrast, was fermented in stainless steel, yielding a crisp, fruity style wine. The 2011 Dry Traminette has a perfumey rose petal aroma profile with a lingering finish. All 3 gold medal winning wines are available for tasting at Domaine Berrien Cellars' tasting room daily from Noon to 5 PM. Winning silver medals were the Domaine Berrien Cellars 2010 Cabernet Franc, the Domaine Berrien Cellars 2011 Sauvignon Blanc, the Domaine Berrien Cellars 2011 Steelhead White, and the Domaine Berrien Cellars 2011 Traminette Sweet. The Domaine Berrien Cellars 2010 Wolf's Prairie Red and the Domaine Berrien Cellars 2011 Vignoles were each awarded a bronze medal. All of the wines that Domaine Berrien Cellars released in May, 2012 now have been awarded medals. Domaine Berrien Cellars is located in Berrien County, Michigan, in the Lake Michigan Shore Viticultural Area (AVA), and produces all estate wines. Set on an 80-acre farm, Domaine Berrien is a family operation, with 42 acres currently planted in grapes. Opened is 2001, the winery offers a quaint tasting room overlooking the wine production facility. Soften cheese (20 – 25 seconds in the microwave or 30 minutes at room temp). Combine with other ingredients and stir. Chill at least 2 hours or overnight. Serve with breadsticks or crackers and your favorite Domaine Berrien Cellars red wine – especially good with Wolf’s Prairie Red! Sandra Silfven is a noted columnist for the Detroit News. Here is a small excert from a recent on-line blog. Click here to read the entire review of our award winning wines! She says, and we agree, "Domaine Berrien Cellars has the best red wines in Michigan." Domaine Berrien Cellars is one of the Southwest's gems — and in my estimation makes the best red wines in the state. This week, owners Katie and Wally Maurer are getting plenty of face time with their fans. Monday night: Wally poured wine at a sell-out tasting dinner at Michigan By The Bottle Tasting Room in Shelby Township, Mich.
Wednesday and Thursday: Wally and wife Katie are pouring wine at the Rhone Rangers Grand Tasting and Winemaker Dinner in Chicago, Ill.
Wally and Katie Maurer have made a commercial success out of the vineyards that Katie's late parents Thomas and Abigail Fricke planted in 1992 — mostly Rhone varietals (whites Viognier, Marsanne, and Roussanne, and the red grape Syrah) in Berrien County. They also planted Cabernet Sauvignon, Cabernet Franc, Lemberger, Pinot Noir and Merlot, plus hybrids. They sold the grapes to other wineries until founding their own business in 2001. With its early emphasis on Rhone varietals, Domaine Berrien Cellars became the first winery in the state to release a commercially grown and vinified Syrah — Shiraz if you are hooked on the Australian wine. Today, Wally's wines, especially the reds, are intense with earthy, robust Old World character. They often are brooding wines with good aging potential. Whether it's the age of the vines — or could it be the age and experience of the winemaker? — they are unique and have developed a wide audience. "I don't make recipe wines," he commented recently. "Every year is a new, clean canvas. I keep the vines happy and stress them when they need stress," he said. He routinely drops green, unripe bunches, if there are too many of them, to enhance the ripening of the remaining clusters.